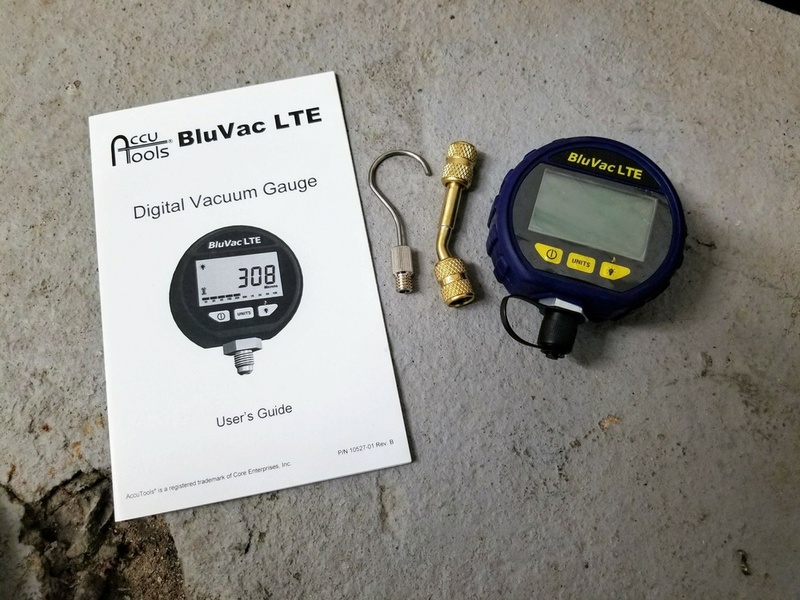 The BluVac LTE digital vacuum gauge by AccuTools is definitely blue and definitely round. But even if it was red and square its performance would still reign supreme. The vacuum gauge comes complete with a threaded hook to hang if needed and a handy vacuum coupler set on a 45 degree angle to keep the gauge upright and away from system oil that may cause contamination. If, overtime the vacuum gauge becomes saturated in oil, the gauge has a built in indictor that will prompt you to clean it. The BluVac instructions come complete with a cleaning guide, the cleaning steps are very simple and easy to complete. One incredible feature of the BluVac LTE is the self calibration test, you can perform this test at any time. After performing the calibration test, if the gauge needs to be calibrated it can be done so without any special tools or devices directly from the job site. This little gauge definitely packs a punch and should be a welcome tool addition to any tech in the HVAC and refrigeration field. As always, save 8% on your purchases at TruTechTools using promo code "knowitall" at check out.